Well, here I am again this Thursday morning to show you a baby blanket I made for a lovely baby Phoebe on her first birthday. Little Man was invited to her party but was ill that day (had a real Niagara waterfall from his nose) so we cold not go. 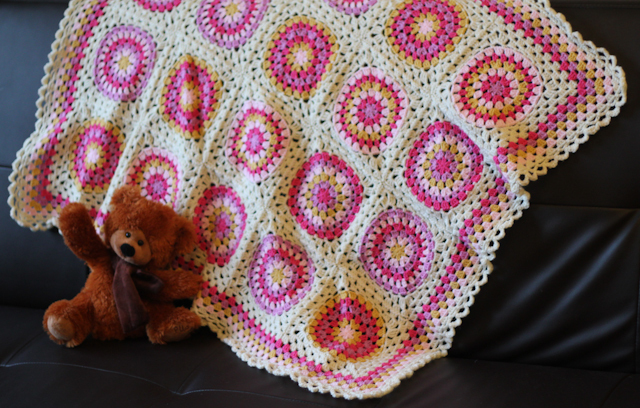 And then it took me more than a month to actually meet Phoebe's mum Jenny and give her the blanket. And as I didn't want to show it before the little owner gets it I'm showing it only now despite it was finished in September. Sorry for the picture quality, had to take them in the evening right before I gave the blanket away. I really wanted to make a picture of it outside, but the weather just didn't let me do it. Here is a little close-up to show you the edging. I was using the tutorial from Attic24 for the edging and must say that it's a good way to finish a blanket. Looks nice and feminine, but not too feminine if you know what I mean. 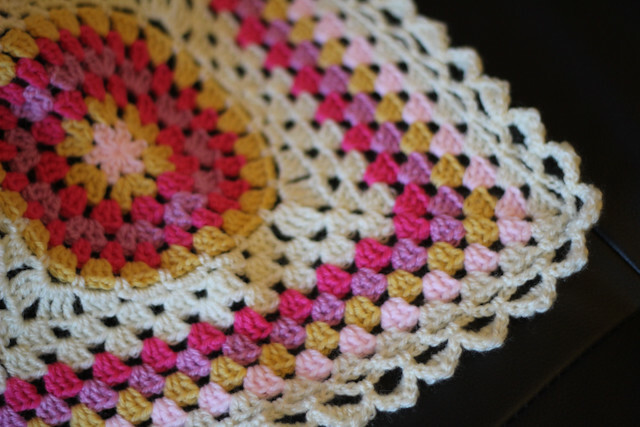 For the squares I used a Squaring Big Circle tutorial from Signed With An Owl and I'm totally in love with this granny square. It's bright, it's fun and it looks really good. So no wonder I really like the result. When I was crocheting this Little Man was trying to steal the blanket from me and ewerything I said about it beeing pink and girlish, so not for him, just didn't help. So I guess he liked it too. By the way, if you are interested in Little Man, he is just fine and started walking two days ago. It doesn't mean that now he is walking all the time, as he is choosing between walking and crawling and since crawling is easier and faster he still prefers to crawl mos of the time. But when he is walking through the room hugging a teddy bear it just looks sooooo sweet! The only problem with taking a photo of it is that the moment Little Man sees a camera he goes back to crawling. Is he shy? Not shure about it yet but will try again and see if I can manage to make some pictures. 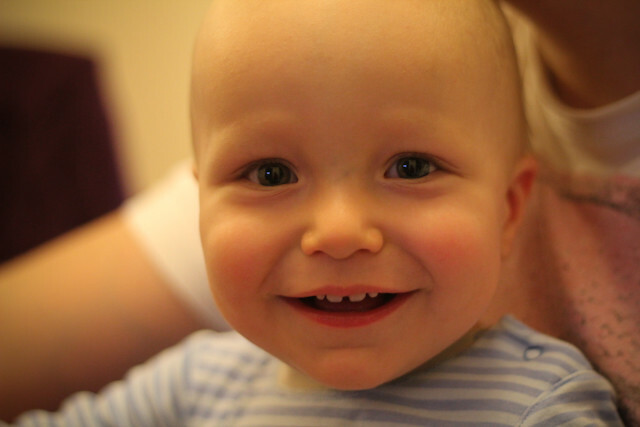 Darya - that is one superb picture of the Little Man! I know what you mean about walking and hugging a bear - my Little Fingers does that sometimes as well, and it is just adorable. Two blog project. Stage two.